New York Giants General Manager Dave Gettleman addressed the media by conference call on Monday. Opening Statement: Thanks for joining me, good morning. Obviously, I’m doing the call do discuss the (WR) Odell (Beckham Jr.) trade, which was finalized over the weekend after Odell and (Giants S) Jabrill (Peppers) passed their physicals. Before we begin the Q&A portion of the call, I’d like to address a few things that have been out there, as well as explain why we decided this move was right for the New York Football Giants. As a point of information, the only call that I initiated regarding moving Odell was to Buffalo. As you folks may or may not know, I have a personal relationship with (Bills General Manager) Brandon (Beane), being the Buffalo GM, from our time spent together in Carolina. I placed the call after I had learned they had conversations on Antonio Brown. I good naturedly chided Brandon about not calling us, and that’s where it ended. So, that’s Buffalo. San Francisco — we had numerous conversations over time; myself and (49ers General Manager) John Lynch, the GM, and frankly we couldn’t come to an agreement, so that died on the vine. As far as Cleveland is concerned, talks were initiated by them and (Browns General Manager) John Dorsey. John knew we weren’t going to give Odell away. So frankly, his initial offer peaked our interest, and away we went. So, the initial call Tuesday morning, we finalized it, it was probably about 10 hours, and there was considerable back and forth. So, the obvious question is ‘Why?’ That’s the question that everybody has. After much discussion, we just believe this was in the best interest of the New York Football Giants. I want everybody to know that this was purely a football business decision. There’s no intrigue, there’s no he said, she said, none of that stuff. So, let’s not waste time with those types of questions after the fact. Odell was a tremendous talent, making him a valuable asset. With football being the ultimate team game — you guys know I’ve said that a number of times — with football being the ultimate team game, we turn that fact into three assets at the very least. Some have questioned why we signed Odell and then traded him. As I said publicly twice, we didn’t sign him to trade him, but obviously things change. Frankly, what changed is a team made an offer we couldn’t refuse. As it turns out, the fact that he was signed for five more years made him very attractive and enabled us to get legitimate value. You ask me about my mantra of not quitting on talent, and yes, I believe that fully, but quitting on talent is when you cut a player, or get marginal value in return, and we all know this did not happen here. Speaking of value, you ask me how we came to this. My barometer or litmus test was the franchise tag. So, just for the sake of discussion, or explanation, if we had not signed Odell back in August, and we had played the season out and we had put the franchise tag on him — if another team had signed him, and we didn’t match it, we would’ve gotten two first-round picks. So, that was my litmus test. Oh, and by the way, as a point of reference, it has only happened once in league history, that was in ’98 with Carolina signing (DT) Sean Gilbert off the franchise tag. Again, as our litmus test, it turns out we not only got two first-round picks, but we also got a third. I completely understand why people are going to debate the merits of this deal, because draft picks are involved. This trade really won’t be able to be completely evaluated until we get further down the road. Finally, because of Odell’s talent and personality, this was a decision we did not enter into lightly. There were a number of factors to take into consideration, and I can assure you we thoroughly discussed them all. Let the games begin. Q: You mentioned that this was just a football decision. Were the distractions from Odell a factor in your decision at all? A: Obviously, there’s a lot of stuff that factors in, but at the end of the day, in order for us to move Odell, the other team was going to have to knock it out of the park. As I said, we were not actively shopping him. Calls were coming to us, and the only one I reached out to was, again, Buffalo, and I was just as much giving Brandon a hard time as anything else. For us to get Jabrill Peppers, who we think is going to be a very good safety in this league. He’s young, we’ve got him under contract for three years at very reasonable value. To get another one (first-round pick), this year is number 17, I think, and to get that kind of a value in this type of a draft, and to get a third-round pick completing our dance card for April, it was just too much to pass up. It was too much value for us. You look at everything, but at the end of the day, it’s really about football. We’ve got positions to address. This was about us having the ability to address multiple positions. Q: You said things came together in Cleveland and you only made that one call to Buffalo. Why not shop around and see what other teams had to offer, to see if you could’ve gotten a better offer? A: That’s a very fair question. When it comes to trading, the team that makes the call is playing from behind. You’re in a much better position of strength when teams call you. You’re in a much better position. Because I wasn’t doing that — we’re not trading Odell, understand what I’m saying? That’s really why it worked out the way it worked out. It (the trade) wasn’t something we had to do, and someone was going to have to knock it out of the park. Q: Can you best articulate what the plan is, and how letting (S) Landon Collins go, trading (WR) Odell Beckham, trading (LB) Olivier Vernon, but bringing back (QB) Eli Manning factors into your plan, and what that plan is? A: Really and truly, very honestly, it’s not my responsibility to tell you guys what I’m doing. Just like it’s not my responsibility to respond to every rumor that comes down the pike. That’s not my job. It’s not my responsibility. Trust me, we’ve got a plan. Over time, you’ve got to be patient. Everybody wants answers now in this instant-gratification society, instant-gratification world, and everybody wants answers now. Over time, you’ll see it. You’ve got to trust it. Q: I know it’s not your responsibility to tell us your plan, but the fans do want to have a vision. They want to know where you guys are headed. A: I appreciate that, okay. We have positions to address, and that plan is to address those positions, plain and simple, and we’ll do it with whatever means necessary. You may do it on a draft pick, you may do it on a waiver claim, you may do it in free agency, you may sign an unrestricted free agent, you may sign a street free agent, you may sign an NQO, a third-year player that doesn’t get a qualifying offer from his team, and you may make a trade. There’s a million ways to do it. We’re exploring and using all those options. Q: Do you view yourself as rebuilding? Or, are you trying to win as you move along here? A: We’re building. The object of this is to win as many games as possible every year. We’re building. We were 3-13 when I took over. We were 5-11 last year — 12 of those games were by a touchdown or less. We’re building. I don’t understand why that’s a question. Really and truly, you can win while you’re building. Down in Carolina, I walked into a different situation. The first year, we go 12-4. Then the next year, we had to build a little bit. We had a crazy year, go 7-8-1, but make the playoffs because the NFC South was struggling. We win a playoff game, lose a playoff game. Then the next year, we did everything but win the ultimate prize. You can win while you’re building. They’re not separate pieces. Q: You mentioned at the combine that you wanted to have ‘X’ amount of dollars for the draft, ‘X’ amount of dollars for free agency. Having $33 million in dead money towards the salary cap, how much was that a factor in your decisions? A: Really and truly, nobody wants to have that kind of dead money, but again, it’s the long-term vision that we have in the building, and what we’re going to do. Sometimes, you’ve got to do those things. There was a team this year with something like $60 million in dead money. That was the route they chose. We talked about it. (Giants Vice President of Football Operations and Assistant General Manager) Kevin Abrams does a great job of looking at it and saying — hey, you’ve got to take a look at this, this is the way it works, this is what we’re looking at in dead money, this is what we’re looking at in cap space. Again, none of these decisions are made in a silo, none of them. Everything is interconnected. So to answer your question, we knew it, and we just decided this was the way we’re going to go. Q: What do you say to those who say you did not get enough in return for Odell? A: First of all, what I say is what’s reasonable, what’s the best you are going to do? Someone sits out there and says you should have gotten four first round picks, you and I know that’s not going to happen. To me, it’s what I said earlier, it’s the litmus test of the franchise tag value. Franchise tag value is two first round picks. We got two ones and a three, one of them being a player. I think really and truly you are not going to be able to know the value. You are not going to be able to give a Roman Coliseum thumb up or thumb down on this trade for a little bit. We have to see how Jabrill develops, and we have to see who this number one is, who this number three is. You guys will obviously follow Odell’s career and we will go from there. In two or three years, you guys will have your opinions like you do now. Q: Did you have any discussions about Eli and his bonus, is there a thought of extending him beyond 2019? A: Yes, we talked about it. We just said we are going to keep moving. Today is the day he gets his bonus and we are just going to keep moving. Q: On Landon Collins, it was clear you guys were not willing to go to that price point. Why not trade him at the deadline? A: First of all, the rumor that we were offered a first round draft pick isn’t even remotely close to being accurate. Did we have teams call in on Landon, yes. At that point in time, it wasn’t what I thought he was worth. At that point in time, we were really struggling, and what message are we sending by trading him. I didn’t think the value was there, and it’s about value, so that’s why we didn’t do it. Q: How does making the roster older in certain spots (Bethea, Tate, Zeitler) jive with your building theory? A: It’s about accumulating really good football players, who are also really good folks. The culture is important, I have said it a million times, you guys know that. The bottom line is with the way the game has evolved, 65 percent of the time you are in sub. You need a guy in the back end that can get everybody lined up and make all the adjustment calls. If you don’t have that, you can’t function. I’ve watched Antoine (Bethea) for years, you talk about a great sixth round pick. He is an adult, he’s a professional football player. He knows what he is doing, he can still play. I have this crazy idea that age doesn’t bother me. I better because my age doesn’t bother me. At the end of the day, it’s about a good football player. Antoine Bethea is still a hell of a football player, so is Kevin Zeitler, those guys can flat play. Plus, we have 12 draft picks, we are going to be really young. It’s about building a team, it’s not about individual players in silos. Q: Are you concerned with the pressure being put on Peppers? A: Jabrill is a hell of a kid. He is very bright, he’s young. We talked about it. At the end of the day, he is coming here to play football. He is going to have Antoine helping him out. Jabrill is very bright in terms of his intelligence. I told Antoine, in time. Jabrill should be able to make the calls back there. He doesn’t feel that pressure, he is thrilled to be coming home. He is very close to his mom, he is going to live in Bergen County, I think. I don’t think he feels that pressure. He is just excited to be a Giant. It’s the team he grew up cheering for, this kid’s coming home. I don’t think he feels that pressure, and we certainly aren’t going to put that pressure on him. There is no reason for there to be that kind of pressure on him. He is coming here to be a safety, play football and help the New York Giants win games. It’ss that simple. Q: Last year when you brought Saquon in, you guys said you didn’t worry about putting expectations on him because you thought he could live up to it and that was from ownership on down. You have laid out expectations for Peppers coming here, you said you wouldn’t have dealt Odell in that deal without Peppers, so in a sense, you are putting those expectations on him, no? A: I’m not putting them on him. He was an important piece of the trade. I didn’t trade Odell straight up for Jabrill Peppers. Jabrill was an important piece to that trade. I’ve said it before and I’ll say it again, I believe in his ability. We watched film, we evaluated and we did him coming out. I was in Carolina at the time, he came in for a private visit down there, so I had personally spent time with him. He’s part of the trade and he’s an important part of the trade. He’s coming here to be a safety for the New York Football Giants. Q: I know you talked a lot about acquiring players and having holes that you need to fill. Just curious how you justify that with bringing Eli back this year against the savings? The $13 million in cap space that it would create if he’s not on the roster. Just trying to figure out how those two ideas can coexist? A: At the end of the day, when you blow the whistle, 11 guys have to go out there. I’ve done that study and on offense you have to have a quarterback run out there. I said it in Indianapolis and I’ll say it again, you turn around and take a look at what happened last year once we got that o-line fixed, better, we’re going to continue working on that and look at what we did the second half of the year on offense. This narrative that Eli is overpaid and can’t play is a crock, I’m telling you. At the end of the day, you guys have to say, ‘Gettleman is out of his mind’ or ‘he knows what he’s talking about when he evaluates players.’ That’s really what it is, that’s really where it’s at and I’m okay if you disagree with me, that’s fine. What I’m telling you is if you turn around and take a look at what he’s making right now, and look around the league and see what quarterbacks are making, if you were in my shoes, you would say, you know what, there is really not — the way he finished the season and what he’s making — there really wasn’t a decision to make. The New York Giants have re-signed unrestricted free agent wide receiver Cody Latimer. The Giants signed Cody Latimer as an unrestricted free agent from the Denver Broncos in March 2018 and placed him on Injured Reserve with a hamstring injury in October 2018. The Giants activated him from IR in December. Latimer ended up playing in six games with two starts, catching just 11 passes for 190 yards and one touchdown. However, he really flashed in the regular-season finale with two spectacular, one-handed catches. The 6’2”, 215-pound Latimer was originally drafted in the 2nd round of the 2014 NFL Draft by the Broncos. In four seasons with the Broncos, Latimer played in 45 regular-season games with three starts. He’s a big receiver who will fight for the football. Latimer is a good gunner on special teams and has experience returning kickoffs. Opening Remarks: Wow. How are you guys doing? How y’all doing? I used to do that down in Carolina, they didn’t believe for one moment that I was from there. Welcome to the Underwear Olympics. It’s good to see everybody. We’re in the roster building season part, there’s no offseason anymore, in case you weren’t aware of it. We’re in the roster-building season, we don’t play until September, I’ve checked the schedule, and so there’s going to be a lot of time to make a lot of decisions so I just want everybody to understand that. Just as a reminder, I’m not going to discuss negotiations, I’m not going to discuss timelines. As far as I’m concerned, that’s very personal between the club and the player, so don’t ask. Don’t waste your time. I’ll say this, it’s a repeat of what I said at my postseason presser – we didn’t sign (WR) Odell (Beckham) to trade him, ok? So I know that’s all over the place, so understand that and that’s all I need to say about that. Then the other thing, I was here listening to the questions you guys were asking (Head Coach) Pat (Shurmur) and a lot of times we focus on numbers – how big a guy is, how fast a guy is, how strong a guy is, what’s his vertical jump, how tall is he, what’s his hand size, what’s his arm length – there’s all these, just a myriad of numbers, analytics’ delight of numbers. One of the things that we really focus on is instincts. Instincts are very important. You guys were asking Pat the question about the quarterbacks. You can write a laundry list of things you’re looking for and it’s not like you’re breaking new ground, it’s not like you’re splitting atoms, but one of the things that I focus on and my staff and we talk about all the time is instinct. Does he have a feel for the game? Is he a step ahead of everybody else? Instincts and play smarts allow you to play bigger, stronger, faster. That’s a fact of life. If you are a film watcher, when you watch it, try to focus on that – is this guy, does he seem to have it? I spent some time with an Aussie rules pro personnel guy a bunch of years ago and in Australia they say, when I was explaining what I was talking about instincts, he said, ‘So you’re saying to me, do they have the ‘chip’?’ That’s what they call it down there. So, to answer your question about tall quarterbacks, short quarterbacks, rollie-pollie defensive linemen, a lot of it is instincts and play smarts. With all that being said, let the games begin. Q: Do you feel as though what you just mentioned exemplifies a player like Sam Mills, a player who doesn’t fit all the measurements but finds a way to make the play every time? A: You do. Obviously, and I’ve said it before, it’s a big man’s game. You can talk about it all you want, the game’s changing and everybody’s going crazy about all the stuff the college guys are doing. Bottom line is it’s a big man’s game. So, if you don’t have size, if you’re missing a PQ – a physical quality, so to speak – you have to have what I call a compensating factor and the compensating factor a lot of times is instinct. Sam Mills was 5’9 – may he rest in peace – was 5’9 in high heel sneakers. He could find the ball. The other day I was watching (Panthers LB) Luke (Kuechly), I was watching Carolina defensive film and I was watching Luke, and I was saying to myself, it’s like he’s in the huddle. It’s amazing. That doesn’t just apply to a defensive player, it applies to every position on the field. Q: You heard earlier that Pat said Eli (Manning) is back for 2019. You were a little vague on that at the end-of-season press conference. What led you guys to decide that? A: Well, it’s a never-ending process. We haven’t even hit free agency yet, so like I told you, I had my conversation with Eli back right after the season ended and we are where we are. Like Pat said, there’s a million different models, there’s a million different ways to do this and you could cite a number of models where they had a veteran guy and they drafted a young guy, and at some point in time, the torch got passed and away everybody went, and it was a happy away everybody went. So, there’s still a lot of time to make these decisions. Q: Is it safe to say you’re not looking for a veteran to (replace Eli)? A: I can’t say anything like that. I can’t do it. You don’t know what’s going to happen, you don’t know. Q: So you haven’t committed to Eli? A: I just told you. We’re evaluating everything and we’ve just got to keep moving forward. Q: How much does not having a third-round draft pick play into (your evaluation)? A: It’s really funny. For what it’s worth, we really feel strongly that if (CB) Sam (Beal) were in this draft, he’d be a second-round pick. We feel pretty strongly about that. So while it’s aggravating that we don’t have a third, if Sam steps up and is doing really well with his rehab thing, surgery went well, and so if he’s the guy we believe he is, then we won’t be mad. Q: Not asking about negotiations, long-term with (S) Landon (Collins), you have a deadline next week, so says the NFL. Will you tag him regardless of negotiations just to make sure you have him for 2019? Q: How important is it to have him back? A: Like Pat says, you always want good players on your team. Here’s what everybody has to understand – you’ve got 53 players on your club and you’ve got a salary cap. You don’t have 53 silos. Decisions like this can’t be made in a vacuum. You can’t do it. So, it’s a process. Q: You talked about your film study with Eli. I’m curious about what you saw when you looked back that maybe you didn’t see live, and if that’s driving you toward your decision process? A: The short answer is yes. You want a little more than that? (Laughter) The short answer is yes. Really and truly, like Pat said, we came in and it was a whir, and we evaluated the team as best we could, made decisions, move forward, and feel strongly we made some good strides. At the end of the day, we saw what Eli was capable of once we gave him help. He still can make big-league throws, he can still make the NFL throws, and it’s, I say it all the time, it’s the ultimate team game. It is, because 10 guys do everything perfect and an offensive lineman falls down, the guy gets whacked. So to answer your question, we looked at Eli and we feel good about him. Q: Philosophically, though, and Pat talked a lot about this earlier when everybody’s playing at a high level and playing better around him, but is that feasible in today’s NFL where you need the quarterback to have everything perfect rather than a quarterback who can make the people around him better? A: I didn’t say he needed everything to be perfect. What quarterback doesn’t? A: Well, you’re talking about a 38-year-old guy against a 21-year-old pup. Here’s what I’m going to say, and I’ve really been thinking about this. I got a headache, that’s why I hurt myself, I think. I’ve really been thinking about this: The narrative around Eli for the past four years, five years, since I was gone, was really negative. The narrative’s been negative. There’s an old saying, ‘tell a lie enough, you believe it.’ The narrative is so negative that when you take that position, most people struggle getting off that spot, most people struggle saying, ‘I’m going to look at this with fresh eyes.’ So for example, when you evaluate pro players, every year’s a new year. When you evaluate him, it’s a new year. Yes, before he was at this level, but that doesn’t mean when you look at him that he’s automatically at this level or at this level. You’ve got to take everything for what it’s worth at that time and I think that the narrative has been negative, and I don’t think it’s been fair. Q: The narrative has been negative because the results have been negative. A: Part of it, it’s going to go hand in hand. We live in a blame society, that’s what we live in. I got in a car accident and it’s his fault. No, maybe you ran the stop sign. Everybody’s pointing fingers, no one wants to take responsibility. It’s part of it. Like I said, it’s the ultimate team game. You don’t win it yourself, you don’t lose it by yourself. Q: With all that being said, at the end of the season you were pretty clear about knowing your situation at quarterback, your 38-year-old quarterback. Q: Is the perception that you’re sticking with Eli and, for all intents and purposes, kicking the can down the road to not have to make another decision at quarterback fair? A: No, it really isn’t. It really isn’t. Free agency hasn’t played out, the draft hasn’t played out. I don’t think it’s fair. Listen, I have this crazy idea that my responsibility is that every decision we make is in the best interest of the New York Giants. I think I said this before, (Panthers Head Coach) Ron Rivera used to kid me, he used to say, ‘Wait until you have to cut one of your draft picks’, because when I first got to Carolina I didn’t know any of those guys so I had to make moves and you do what you have to do. When the time came, I picked and chose who we paid money to. I’m going to do the same thing here. These decisions are not made with my heart, they’re made with my head and with the experience I have. I’ve been lucky. I’ve been around a few Super Bowl teams. I know what it takes to build one, I know what it should look like, and at the end of the day, no, I don’t think it’s fair. Q: So, conceivably, you could see Eli Manning back on your roster for this year, and another quarterback — whether it’s a veteran or a rookie — challenge him at that spot or for the future? A: Yes. You can’t be afraid to draft over a player. You’re in the draft, you’ve gone through free agency, you’ve got all your stuff going, and you’re sitting there and you’ve got a good player at a position and a young kid comes up at that spot staring you in the face. You can’t be afraid to draft him just because you’ve already got one. The more competition you can create, the better your team will be. And you have to create competition at every position. You have to, because if you don’t, unfortunately human nature sometimes takes over and the guy gets a little lazy and he thinks is anointed, and all that other stuff. Does that make sense? 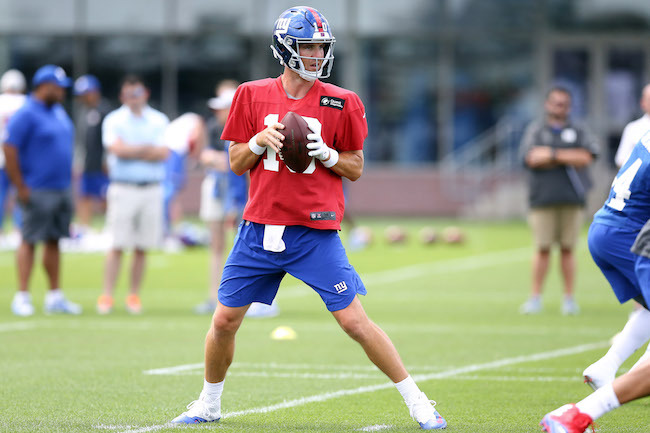 Q: Have you ever got to that situation where you look at Eli and think that because he hasn’t had any competition, or do you think bringing in competition might actually bring his game to the level that you’re expecting? A: Absolutely, it’s very possible that that’s going to happen. Q: Is adjusting Eli’s $23.2 million cap something you’d consider? A: You have to look at everything, I’m not going to lie. I’m not saying I’m going to do anything (laughter). I’m just saying it’s my job. It’s my job to take everything into consideration. A: You guys got to write about something, I guess. Speculate all you want. I’ve already made my statement on that. Q: Do you expect Olivier Vernon to be on the team this year? A: Again, we’re in the evaluation process. I hope I’m with the team this year. Q: Why were you comfortable trading Eli Apple? A: Why was I comfortable trading Eli? Because of the value we got in return. We thought it was in the best interest of the New York Football Giants. Q: Did you pay attention to him after (he was traded to the Saints)? A: You have to. Again, shame on me if I don’t check my hole card. So, yes I did. A: Me personally? No. I’ve been spoiled as hell. Q: So you have been spoiled? A: Are you kidding me? (Jim) Kelly, (John) Elway, (Eli) Manning, Cam Newton — not bad, huh? A: It’s really funny. I have one of the best consiglieres of all time. I talk to Ernie (Accorsi) all the time and what Ernie did for the Giants, it would be a dream for me to do the same thing. Does that answer your question? Q: Inaudible – On scouting (Justin Herbert) and his decision to go back to college: How do you try to weigh this year’s (draft class) versus next year’s? A: It’s an interesting question. I think at the end of the day, you can’t say to yourself, ‘I’m going to get him next year.’ You evaluate the Q’s, and you take the guy when you believe he’s the guy and it’s at the right spot. You can’t worry about the future because now someone else is going to say, well, in two years there are a couple college quarterbacks that are coming out that are really amazing. Who knows? I look at the NBA, and everybody says, ‘you’ve got to tank. We’re going to tank and we’re going to get this great player.’ What NBA team has tanked and it’s worked because they think they’re going to get (a player)? (Response: the Sixers) When they win a championship, we can have a discussion, but until that happens, it hasn’t worked. So at the end of the day, if the right guy is there at the right time who we think is the right guy, we’ll pull the plug. A: Which is just at the very beginning of the process. You’ve got Indy, you’ve got the workouts, we’ve got private visits, we’ve got interviews. You can’t line them up now, and if anyone has them lined up now, God bless them. They’re smarter than me. Q: You mentioned doing what Ernie did would be a dream for you. We know you won’t reach for a quarterback but you already gave up future draft picks, traded up so to speak, even though you have Eli. Would you be comfortable making that bold move if you have the guy you want? A: No guts, no glory, kid. A: I fully expect him and again, you’re going to ask me about particular players, Dave will tell you – you’ll speak to him later – I’m a body collector. I want to keep all the players we had and add a lot of new ones. I really feel that way about Eli. A: I’m intimately involved in it, both the free agents and then obviously the draft players. It’s very collaborative, we all want to hear what everybody has to think about every player and every situation. We talk about it frequently with ownership and we just try to make the best decision, and if it’s a matter of this player is no longer going to be here, let’s get a guy that’s better. That’s what we’re trying to do. Q: You talk about being a body collector, and obviously there’s a couple quarterbacks that could be on the board at (the sixth pick). What do you look for in a young quarterback and what do you value out of a rookie quarterback? A: I think they’ve got to have the traits you’re looking for to play the position. Times have changed, quarterbacks come in all shapes and sizes. Then you obviously have to watch them play. They need to be productive, they need to make good decisions, they’ve got to know how to throw the ball accurately, throw the ball on time, they’ve got to lead their teams to victories, and they’ve got to do all the things necessary to play the position. That’s what we look at. We evaluate all the quarterbacks every year regardless of whether it’s perceived we might be looking for one. A: The Vanderbilt quarterback – well, I’m extremely proud of him. He’s made great decisions. He did an excellent job in high school giving himself the opportunity to go to a place like Vanderbilt, graduated in three and a half years, helped them win games. He’s a good player. Q: There was a quote you said last year about preferring taller guys. That’s made headlines the last couple of weeks. How does that fit in with (Kyler Murray)? A: I think you’re digging into something. Obviously the player has to be productive, and as I just mentioned, quarterbacks come in all shapes and sizes. Russell Wilson won a Super Bowl. I think you’ve got to look at the total player, look at his productivity, and you’ve got to look at whether he fits and then we as coaches will use their skillsets to the best of their ability to try to get the most out of him and help you win games. Q: Does the baseball alternative scare you with Kyler? A: No. That’s going to run parallel with our decision making of whether we like him or not. A: We’re always trying to and, again, there’s all these narratives and the next franchise quarterback, replace this guy and do all this, and we’re trying to make our team better. We certainly, it’s no mystery Eli’s closer to 40 than he is 20. That’s no mystery and certainly we’re going to do the very best we can to get the best players, especially the one that’s playing quarterback. Q: How do you scout the AAF guys? A: We’ll watch the games. I haven’t had an opportunity to see much, I’ve kind of been following it and I’ve got some good friends that are involved in that league. It’s a league where guys are getting an opportunity to develop, especially at the quarterback position and some of the skill player positions. I don’t know much about the games yet, I haven’t had a chance to watch many of them or really any of them, I’ve just seen segments of games. Yeah, we’ll evaluate it and it’ll give us an opportunity to see these guys develop. Q: In relation to Kyler Murray: How small is too small of a quarterback? A: I don’t know what’s too small. Russell Wilson’s 5’10, we haven’t seen Kyler be measured yet, but when you watch him on tape he’s an outstanding player. For a sub-6’0” player, he only had five balls batted down. That’s why I say you’ve got to look at the player and how he competed, how he helped his team win games, how he moved his feet – you’ve got to look at all of it and then factor it in and decide if that player’s for you. A: I don’t know. I feel like this is a human game, played by humans, officiated by humans. We’ve done a lot to help get things right and I think there’ll be conversations about making sure that that continues to happen and try to find ways. I don’t know how the language would read to expand it, but I think what’s interesting about all of it is if something’s wrong, we all want to find a way to make it right. I think that’s initially what replay was all about. We’ve got a lot of very smart people, much smarter than me, trying to figure out what’s the best thing. The good thing is we talk constantly about trying to make changes and improvements, and I’m sure we’ll do something. A: You look at the core traits, and that’s why I say this, that once you’ve seen that they’re a really good player, you’ve got to determine whether they’re a very good decision maker. That crosses over into all areas of their life, because we all know what we’re looking for from the face of our franchise. And when the game is over, they ask a lot of people what happened, but every week, they ask the head coach and the quarterback what they think. That player is thrust into a position of leadership and being the face of the franchise, so decision making is important, accuracy, timing, all of those things, and I think we’re looking for all that. A: No, we’re going to look at the player and decide whether he’s the guy that we want to be with the Giants. Q: What’s your initial assessment of the overall quarterback class? A: I’ve watched, there’s a lot of really good players playing quarterback this year that we’re evaluating. Nice try, I’m not going to sit here and evaluate them for you. Q: Strong class? Stronger than last year? A: I don’t know. There were a lot of good quarterbacks and I think there’s a lot in this year’s draft as well. Q: Are there any important thresholds for quarterbacks? A: Some of the numbers are important. We’re obviously looking for things that are elite in a player and, again, they come in all shapes and sizes. Q: Have you talked to (S) Landon (Collins) in the last week? A: Yeah, I’ve spoken to Landon throughout. He’s been in the building rehabbing and working out, but I haven’t since the report. I think it was reported with way more drama than what actually happened, but yeah. Q: Do you expect him to be on the team next year? A: As I mentioned earlier, I want all our players back, but beyond that, it’s free agency. This is the wrong time for me to be commenting on any of that. Q: Are you aware if there have been active negotiations with Landon Collins? A: I am aware that he’s a free agent and I’m aware of the fact that there have been conversations. A: Yeah, you bring up a good point. I stood up here last year and Dave, too, was very new. 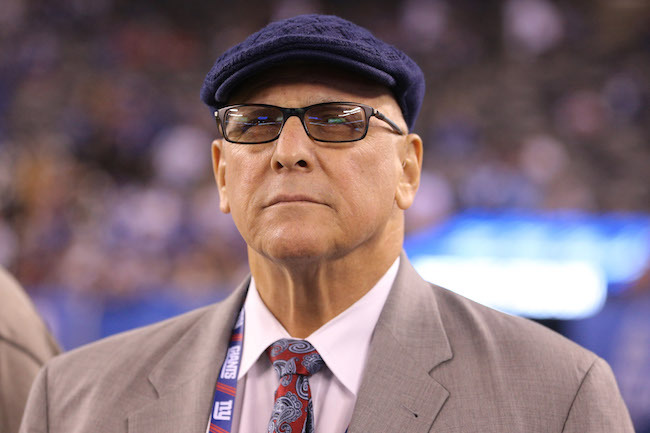 Dave was with the organization for many years and then was away for a few, so we were very new in the process listening to what those that were at the Giants were telling us about the players, but we have a much better view in our eyes of what our team is all about. We took over a 3-13 team, I think we made strides this year. We certainly are not good enough in really any area, we know though specifically those areas that we need to get better and I think that’s what that first year can do for you. Q: To clarify, you said there have been conversations (about Landon Collins), do you know if you guys have extended an official offer on a multi-year deal? A: I wouldn’t ’t talk about that. This is the business time of year. I know that there’s been conversations. Now, what those conversations are, I would never tell you. Q: When you’re looking at prospects, is it the consistency of their unique traits that make them a full prospect, or just a good college player? A: At all positions, yeah, there is. There’s things we’re looking for, and really as a coach, we go back to – we watch the tape, we watch them do what they do. There’s a lot of players where you turn the tape off and you say, ‘Darn, that guy is a really good football player.’ Then you go and look and maybe his measurables aren’t to what the standards might be, but you still love the player and you want to work with them. Then there’s other guys who have the elite measurables and you go watch the tape and you go, ‘Eh, he’s ok.’ That’s where it becomes a little bit subjective and that’s why getting to know the player, getting to know whether he’s going to be a good teammate, if he appreciates what it means to have relationships with coaches, that’s why all this is important because we get to know the player a little bit more intimately. Q: There was a lot of talk last year on how instrumental you were in getting Odell Beckham to buy in even when he didn’t have his contract. A year into this, where does your relationship stand with Odell? A: I think it’s good, I really do. I’ve communicated with him frequently in the last few weeks. It’s unfortunate he wasn’t able to finish the season, but it’s good, it’s solid. He’s like many of our other players, he’s off living, I think, in California now, but he travels quite a bit. He does a great job of staying in shape and look forward to having him back. Q: Are you considering trading Odell? A: I wouldn’t talk about that, but I’m looking forward to having him back here in April and moving forward with the rest of the guys. A: There is. I think you can say, ‘OK, this guy has got it.’ I’ll go back to what I was saying about measurables, some of these guys have really good measurables or put up really good numbers but might not have as good a feel for the position as some other guys. That’s why this is really an important process. You’ve got some small college guys that played well and then you have guys who played on the big stage that have done a good job, but some of their success is based on the fact that they were playing with great players. That’s what’s really interesting about this is trying to predict and then pick the one that’s going to have success. A: I think it’s a little bit subjective, but you look at the young man and you just kind of look at him and say, ‘OK, this guy’s got potential to grow and get better’. I think at this stage, all the players do to some degree, but some certainly have more room to grow than others. A: The decision to pick that player has got to be independent of that, but I think that’s going to be a great thing to happen to a player if that happens. I’ve spoken frequently about what I think of Eli and how he handles himself and how he prepares, and really everything he does behind the scenes, and I think a young player would greatly benefit from that. We all want to learn from somebody that’s done it – players, coaches – and he’s done it at a very high level and so being in a room with him I think would only help that player. Q: You said your goal is to win as many games as possible. You also said that Eli is closer to 40 than he is 20. How do you balance a potential quarterback versus a guy you can plug and play? A: I think the plug and play vs. the guy that – you’re still looking to play the best guy. I’ve been in situations where Sam Bradford started the first game. I was in another situation where Donovan McNabb didn’t start until Week 8. In fact, Doug Pederson was the starter. You’ve seen in Kansas City where (Patrick) Mahomes really didn’t play the first year, so there’s a lot of different models for that, speaking specifically to the quarterback. A: Oh yeah, we’re trying to get better in all positions and running parallel with that is all the things that everybody has questions about. Q: How big is mobility while looking at a quarterback? A: I really value a guy that can move around because it doesn’t mean he’s a runner, it just means he has a way to clean his feet in the pocket or scramble when necessary. Typically, if you’re going to have long drives and do it on a consistent basis, somewhere in that drive the quarterback has to do something with his feet to keep a drive alive or get a first down. Even guys that are not considered mobile, it might be subtle movement in the pocket. That mobility, I think, is very important. I think it’s essential really for a quarterback to have great success. Opening Remarks: Happy New Year! It’s good to see everybody. I hope Santa made a visit, or you had some good potato latkes. It’s good to see everybody. I just wanted to open with a couple thoughts to get us going. We’re headed in the right direction, I really believe that. We’ve had a year, we’ve done a lot of different types of things. Obviously we’ve done a pretty extensive overhaul with the roster. We consistently talked about culture and building a winning culture. Again, it’s a team that had to learn how to win again. So I feel really good about the foundation that we’ve started to lay. I’m not happy with 5-11, nobody is, but I feel good about where we’re headed. There’s eight franchises right now looking for head coaches and the common theme coming out of them was they needed to get in the right direction. Well, I feel very strongly and very good about it – and it’s easy for me to say it to you people that we are headed in the right direction. As far as the team’s concerned, I’ve told you guys this and I mean it: there isn’t a day that doesn’t go by that I don’t ask myself the question, have me and the personnel people given Pat (Shurmur) and the coaches enough players to win with? I ask that question of myself all the time because roster building is a 12-month deal. The season doesn’t begin, ‘this is the 53 and this is the 10 guys on the practice squad, and away we go.’ You have to constantly evaluate what you’re doing, so like I said, roster building is a 12-month season and I’m very conscious of that. Like I said, we had a significant overhaul this year. By the end. I think we had on the varsity, we had like 13 guys that had an NY on their lid last year. That’s it. That’s a pretty extensive overhaul. Not every move’s going to work out, oh by the way, as we’ve seen. The other part of it is, I believe in that definition of insanity – keep doing the same thing and expecting a different result. It’s true, so you’ve also seen that we make a decision and if it’s not working, we will make a change. Again, we still have roster work to do, I’m not going to deny that for a moment. Then the last thing I want to talk about before I take your questions, just to get it out there just so you guys understand, (QB) Eli (Manning) and I had a very extensive conversation on Monday. No holds barred, he took me in the low post and won, but the bottom line is it was a very honest and up front conversation. I’ll keep what was said private between he and I, but in terms of any question you’re going to ask me today, just so you understand – we will do what is in the best interest of the New York Football Giants. That’s the way we’ve operated since I walked in the door, and that’s the way we will continue to operate. What we’re trying to do here is build sustained success and that takes some brutal honesty and it takes some tough decisions. Then finally, just as a quick reminder, don’t ask me about contracts, don’t ask me about negotiations, don’t ask about any of that stuff because I’m just not going to respond. Ok? Alright, let the games begin. Q: How do you evaluate the quarterback position when you look at a 1-7 start to the season and then four wins over the second half of the year, three of which were against backup quarterbacks? Eli seemed to play better, but the pressure was essentially off at that point after the 1-7. So how do you weigh those? A: First of all, I don’t want to hear about ‘backup quarterbacks’, ‘we played backup quarterbacks’. We went 4-4 in the second half. Here’s what I would say to you, when you’re bringing in and installing a new offense, you’re looking at four to six weeks before everybody’s really on the same page, and it’s really the outlier, it’s six. It’s going to be the outside of six. We were having O-line issues, weren’t we in that first half? We made changes and I think that’s part of it, that you’ve got a comfort factor in terms of you’re on the same page, the offense is on the same page, and you’ve also got a comfort factor in that the O-line, putting Chad (Wheeler) out there, claiming Jamon (Brown). Jamon came in out of the bye, that’s when we got him. So doing those kinds of things, that settled everything down, the combination of those two, and I think that’s the reason that the offense started to click. I almost fell down when they told me we scored more points than anybody else in the division, which kind of blew my mind. They swore to us, so I hope I’m not lying to you. The distance that the offense came from Week 1 to Week 16, you think of the points – the backup quarterback that we played against, for example, (vs. Chicago), he didn’t play defense, and the other backup, Washington – those guys weren’t on the defense, they were on the offense, so you’re asking me an offensive question. At the end of the day, between the fact that they were able to get comfortable with each other and we settled the offensive line down, we scored points. I saw a graphic, I think we averaged 27-28 points a game the last half of the year, something like that. Q: Are you committed to having Eli back next year? A: Here’s what I’m committed to do. I’m committed to making the best decision in the interest of the New York Football Giants. That’s what I’m committed to do. We’re in the evaluation process. I know that you guys want answers now, but very frankly, I didn’t come in yesterday. I’ve got to do what I do, which is get in my office and watch film. We’re going to meet this week with the coaches and get their evaluation. We’ll meet next week with pro personnel and get their evaluations and get their feelings on everything. That’s our schedule, and I will be watching film for the next who knows how long until my eyes bleed. That’s what I do. So, my commitment is to make this team the best team it can be and if that happens to have Eli playing quarterback, it does. Q: Why do you feel good about the foundation? Why do you feel good about this team? A: I’ll tell you this, and I know that I’ve said this before when we had our little fireside chats during the season and you guys looked at me like I was a little off, I feel good because, number one, winning in the NFL is not easy. It’s hard. Winning a game in the NFL is hard. If anybody tells you any different, they’ve never played, they don’t know the game. It’s very difficult. To go 1-7 for the first half of the year and to lose a number of close games, I think we tied for the league lead with 12 games decided by a touchdown or less, and it would’ve been 13 if the Saints didn’t score that late touchdown. To lose games like that, be 1-7 and to have the types of practices we were having where there was focus, there was energy, things were getting accomplished and the proof was in the pudding by what we did in the last eight games. That’s what encourages me, that’s why I think the foundation is right. You didn’t have any of the crap going on in the locker room that happened last year. There is nobody in this room that can argue with me on one point: this team did not quit. It was competitive as hell. That’s the start. Q: You said you almost fell down when somebody told you that you led the division in points. Did you almost fall down when someone told you that you gave up the most points, too? Q: That was evident to you? A: Well, that’s why you’re 5-11. Q: Is that the main reason you think you’re 5-11? A: We’ve got to continue to improve. It’s not easy to win games when you don’t have playmakers. We need to improve the defense, guys. Just like I looked you right in the eye last year and told you we’ve got to fix this O-line, we’ve got to get better on the defensive side. Q: You inherited two big contracts with Olivier Vernon and Janoris Jenkins. How would you evaluate those two, the way they played this year and moving forward? A: I haven’t. This is what I’m going to do the next two weeks. My personal feeling is the biggest mistakes are made when you’re emotional. When the season ends, you’re emotional and you’re mentally cooked. So until I start watching the film, which is going to start today, I really can’t answer that question. It’s not fair. Q: When you look at the moves you made last offseason, do you think you misjudged how close this team was to being competitive? A: I didn’t misjudge it at all. That’s been asked before and I’ve thought about that. I had no illusions of what we were. None. You tell me why you think I misjudged it. Q: If you know you’re going to be in a rebuilding process, you bring back Eli, you don’t draft a quarterback, you trade, give up a draft pick for (LB Alec) Ogletree, you bring in older veteran free agents, those types of things. A: You’ve got to start somewhere. But by the end of the year, we had one of the youngest teams in the league. Listen, nobody likes losing. Nobody. Anybody in here like losing, you want to raise your hands? Nobody likes to lose. So what you have to do when you come in is you evaluate what you have and you say to yourself, remember, I’ve told you guys – I’m on that tight rope, and me in a tutu on a tightrope ain’t pretty. It’s the tight rope of you want to win now, you want to get those wins now because you’ve got a coaching staff whose fannies are on the line every Sunday, and you want to set the team up, the franchise up, for sustained success. We sat back, we made the decisions we made last year, and here we are. There’s some good stuff and there’s some stuff we’ve got to fix. Q: You talk about not wanting to make judgments about players without looking at film. Last year at this time, though, you were very committed to Eli Manning. You said what you saw late in the season wasn’t a mirage. I’m just curious, is there a chance there will be a another starting quarterback next season for the Giants? A: Listen, there’s a chance you and I are going to get hit by a bus. We’re going to do what’s in the best interest, we’re going to look at film, we’re going to evaluate everything. Everything’s on the table for us. Everything is on the table for us. Okay? Q: When you look back at the evaluation process that led you to Jonathan Stewart and Patrick Omameh, do you have to do some self-scouting and go into this offseason differently? A: We’ll go into this season because we have different issues. One of the biggest issues we had last year that we had to fix was what? The locker room. And both Jonathan Stewart and Patrick Omameh are true professionals, and they were brought here for a specific purpose, they were brought here for other reasons than their play. Just understand that. We feel like we’ve turned that corner, especially with this rookie class. (RB) Saquon (Barkley) is unique. I stood up here and you watched me drool all over myself in the pre-draft. It was ugly, wasn’t it? Things happen. I should’ve worn a bib from Joe’s Stone Crab. My point is, he’s unique and he’s special. So is (G) Will Hernandez, and (DL) B.J. (Hill), and (LB) Lorenzo (Carter), and (DL) RJ (McIntosh) is still growing up physically, (QB) Kyle (Lauletta) is in a different spot because of the quarterback position. But this is all part of the process. We’ll continue to vet guys out, we’re only going to bring quality people in here that hate to lose. That will stay the same. Obviously, we’re different than we were 12 months ago, we’re in a different place, so we’ll approach things somewhat differently. Q: Last year when you evaluated Eli Manning, you hadn’t seen him play throughout the season, so you had to rely on the film. You’ve seen him take every snap this season, you see him in practices. Why do you need to go back to the film to form an opinion on what you just saw over the last four or five months? A: I always want to be right. You always want to have your hole card and that’s me, that’s just my nature. I’m a film junkie, and there are things that I remember that happened that, oh, my gosh – that’s me. Understand this, and I think I’ve said this to you guys before: I am very intentional about how I operate. Very intentional. Methodical. Some people call me an Alta cocker (old man), whatever you want to say, but that’s just the way I am. I’ve been that way my whole career in the NFL. Very methodical about film watching and thinking about things in making decisions. I’m very intentional, that’s why I say yes, I watched every snap, but I want to watch the film and I want to have time to breathe. Q: When you go back and you do this evaluation, obviously you’ve got guys like Eli Manning who have been playing 15 years, you’ve got some other guys who have been playing a couple years. When you do your evaluation and base it on everything, are you looking ahead or are you looking back at the entire body of work in terms of what they’ve done in the past, injury history and all that stuff? A: Obviously, it’s different. When you’re looking at older players, you’re looking early, middle and late, did they fade? When you’re looking at younger guys, you’re looking for early, middle and late, did they improve? That’s what you’re looking for. It is a little different, I remember – I’m really going to date myself – back in 2000 when we brought in those three offensive lineman, Lomas Brown, Glenn Parker and Dusty (Ziegler). The big question for me on Lomas was what was he playing like in December because Lomas was long and lean. He wasn’t a power player, he was an athletic tackle, so I wanted to see is Lomas the same player in December that he was in September? When you’ve got older guys, you’ve got to do that. You’ve got to see if they fade or not. That’s why I will look and look and look and look until I have the puffs of white smoke coming out of my ears or my head or whatever. Q: Pat Shurmur to us has been very supportive of Eli, saying he thinks he’s got years left, leadership, experience, makes the throws, all that stuff and pointed out that the last eight games, this offense scored a lot of points with Eli. How much will you take that into your evaluation of Eli that the head coach seemingly wants this guy back? A: It’s part of it. This is not a dictatorship. I really am a big believer in collaboration. I’m not a dictator, I’m not. These are conversations that you’re going to have with Pat, that’s why I say we’re going to hear the coaches and what they have to say, we’re going to talk to the pro guys and what do they have to say, and then I’ll get my work done and we’ll get together and formulate a plan. Obviously it’s part of it. Pat’s had a lot of success with quarterbacks, so I’m certainly going to listen. Q: When you and Eli had that conversation Monday, did the two of you come to conclusions, or did you leave it as the fluid situation that you’re portraying it to us? A: We left it at that. We had a great conversation. He’s a mensch (a person of integrity and honor). Q: I know you want to watch the film, but you when you watch this team every Sunday, what is your evaluation of your offense with and without Odell? What difference is that? A: He didn’t play the last four games, right? Listen, the bottom line is you want him on the field. I have this crazy idea that he’s a great player, so let’s get him on the field. Unfortunately, he got the leg whip and those calves (quads) can be funny things, they really can. The offense did what it did with him and it did what it did without him. Q: You guys obviously made a huge financial commitment to Odell Beckham just a few months ago. Are you committed to him being here in 2019 or are you open to trade ideas or anything as well? A: We didn’t sign him to trade him, if that’s what you’re asking me. Q: So he’ll be here? A: You heard what I said. Q: A year ago, you stood there and left very little doubt that you were committed to Eli. You were very strong about that, Pat was (too) a couple weeks later at his press conference. Today you’re saying you’re going to do what’s in the best interest of the Giants. Does that indicate a change in your feeling and commitment to Eli? A: No, it isn’t. It’s funny, last year that was the question. That was the question, but if you think about it, the guy was running for his life last year. This year, we calmed it down. Once we got rolling, once everybody got comfortable with the offense, if you’re going to look at stats, it wasn’t too shabby what (Eli) did. Obviously, we want to win more games, and we’ve got to continue to improve the roster. Q: How did he look to you in December? A: In December? We scored 36, we scored 35, 27, scored 40. How does that look? He still can make the NFL throws. You know what I’m saying? He’s still got it. Q: What would be the ideal scenario at quarterback going into next season? Would it be Eli and a first-round pick? Eli and you bring in another young player? Eli and a veteran free agent or just turning the page? A: I can’t answer that question because I don’t know what the field is right now. I don’t know what the field is. Q: How important is it for you to address the quarterback of the future of this team this offseason? Is that a priority? A: Let me tell you something: if you make something a priority, you will make a mistake. It’s got to be within the flow of what you’re doing. You can’t force it, especially at quarterback. That’s why the guys in Carolina looked at me like I was out of my mind, you guys looked at me (like I was out of my mind). You get in the draft, you’re taking the best player — you’re not taking, ‘ I need a ___, so I’m taking a ___’. No. You do that, you’re going to make a mistake, you’re going to screw it up. Q: The Giants have had one winning season in their last six. What is your message to Giants fans right now? A: The message is what I’ve said to you before: we’re going in the right direction, we had a lot of competitive games and we’re getting better, and we’re going to continue to fix this. Q: What is Kyle’s (Lauletta) future here? Are you still as high on him as you were (when you drafted him)? A: We drafted him in the fourth round, he did some nice things in training camp. He did something silly in Hoboken or Fort Lee or wherever the hell it was (Weehawken). He’s developing, he’s like anybody else. I’m going to be a little bit of a jerk here maybe to some of you, how many of you guys wrote Pulitzer winning articles your first year as reporters? You understand what I’m saying? He’s a kid. I’m a kid, you’re kids, we make mistakes. None of us are perfect. Hopefully we learn, so to answer your question, Kyle’s a work in progress, just like me. Q: When you traded Snacks (Damon Harrison), I believe one of the reasons you said was so the young guys could get some valuable playing time. How would assess what they did with that? A: When we traded Snacks, part of the issue when Snacks was here was he played the one, we had Dalvin (Tomlinson) playing the three, and B.J. (Hill) playing the five techniques. Well, Dalvin’s a one technique and B.J.’s a three, so I’m very pleased with the change, to answer your question. B.J. came a long way. Pass rush is critical, as I’ve stated it a million times as we all know. B.J. had, I think, five and a half sacks, so he made some progress inside. Dalvin did what he does at the one, so for us, it worked out and those young guys are getting snaps. That’s the only way they’re going to get better. There’s a theory out there that young guys, once they get to 5,000 snaps, that’s when they’re really ready to rock and roll and that includes practice and game snaps and all that. I don’t know if I subscribe to it, but I’m just throwing it out there. Q: On the decision to keep Eli Manning: Will that decision, though, involve money? Can he have the talent to play here, but if he makes too much money, he can’t be here? A: I’m not going to go down that road with you. Obviously part of the salary cap is, players are not in vacuums when it comes to that salary cap. Nobody’s in a vacuum. You don’t say, okay, I’m going to sign this guy, I’ve got to sign this guy – no, wait a minute, you’ve got to look at your cap situation. But I’m not going to go there. Not going there. Q: Eli’s father (Archie Manning) told ESPN that if Eli wants to come back that you guys need to win, that he can’t go through another season like this. 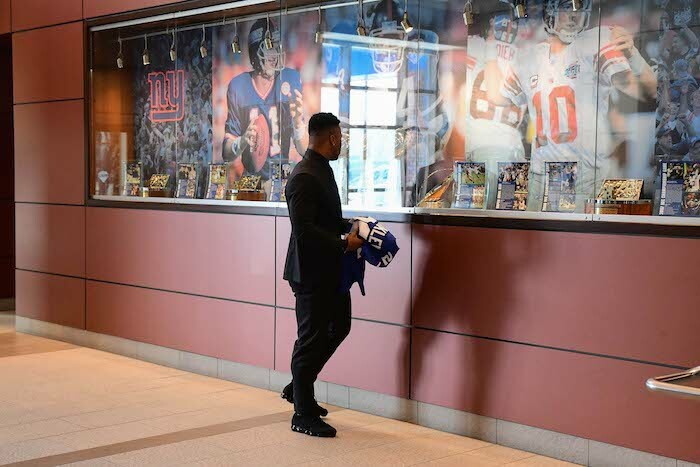 Can you guarantee to Eli that you will have a winning team for him to want to continue to play here? A: Really and truly, can anybody guarantee anything like that? Really? All you Yankee fans thought you were going to win 162 games this year (laughter). I knew better. All kidding aside, you can’t guarantee that. There’s no way. I wouldn’t guarantee that to anybody. Q: Do you understand his point? A: No, because Archie didn’t tell me. Q: How do you respond to the ongoing idea that you should’ve taken a quarterback, regardless of how great Saquon was his rookie season? A: I respond to it by saying, again, you’ve got to take the best player available. If you start reaching, you’re going to get into trouble. I’ll say it again: us taking Saquon was not a referendum on the quarterbacks, it was a referendum on Saquon – on the player he is, and on the person he is. If I was in that situation 100 times, I’d draft him 100 times. Q: You have (Nate) Solder, you have (Will) Hernandez. Do you feel like the other three guys could be your starting line next year? Is it a big emphasis this offseason? A: Here’s what I would say – first of all, don’t forget (C Jon Halapio) Pio, don’t forget Jon. He went down, unfortunately, in the second game. He was playing the best of anybody. So, don’t forget about Pio. I am always going to keep working on those lines, on those groups. You cannot have enough hog mollies, you can’t, because people get hurt. You can’t have enough. People looked at me in ’13, we took a defensive tackle in the first round, a defensive tackle in the second round, and I had people say, and maybe they’re right, ‘Gettleman has no idea what he’s doing’. I’m always going to do that. Q: Why is this offseason different from year one for you? What is different about this process? A: I think what’s different is we’ve got a better understanding of what Pat and his coaching staff are looking for, because you’re looking for scheme fits. Last year was not easy, because we’re moving to that 3-4 look – that type of 3-4 that Jimmy (Bettcher) wants to play. There’s different style players on it, and you can’t fit a square peg in a round hole. That’s part of it. We have a better understanding of what the coaches are looking for and it makes it big. When I went to Carolina, it was a 4-3. We had played a 4-3 year after year. So for me, it wasn’t a big deal. The offense was not a big deal. It’s really the defense that’s different. Q: So it is fair to say the challenges last year were on the defensive side of the ball? A: Exactly, and you can only trade out so many guys. When you blow the whistle, 11 guys got to go out there — at least you want 11 out there. Q: Did you see anything to make you waver, in your mind, that Pat Shurmur is the right guy for this moving forward? A: Not at all. If anything, it reinforced my feeling about him a year ago when we went through the interview process. It was the steadiness, it was the message. We’re 1-7 and we have two practices during the bye week, I just was kind of amazed. Again, you guys may gloss it over, but I don’t know that you can really appreciate it. You’re (the media) there, and then you’re gone. You watch them stretch – what are you guys there, 15 minutes? Then you’re gone. To stand there for the next hour and 40 minutes, I wish you could’ve seen it. Just the way Pat and the coaches kept everyone on task, going in the right direction, understanding that, to a certain degree, maybe we were the little engine that could. We kept pushing that thing up the hill. There’s no doubt in my mind that he’s the right guy. Q: Why did you feel the need to have a straight-forward conversation with Eli? A: I have this crazy idea that I’m always going to be honest and straight-forward, and sometimes that gets me in trouble, but we won’t go there. Eli came in and he wanted to talk. I just have this crazy idea that if a guy asks me questions, I’m going to be honest with him. It wasn’t like he was called to the principal’s office. He came to see me. A: Because he is – the way he carries himself, who he is as a person, the way he respects the game. You know men in your life who are not mensches. You know what a mensch is. There’s no deviousness, there’s no duplicitousness, none of that stuff. He’s a mensch. Someday, I hope to be a mensch. Q: Do you look at this as a rebuild? Is it a multi-year process you’re in to get back to being a Super Bowl contender? A: I just hate the word rebuild. You just keep going, you just keep building. It’s really what we’re doing here. We’re doing our best to accumulate the talent that fits our schemes, and that understands how to play the game, and hates to flippin’ lose. That’s what it’s really all about, and we’re going to continue to do this and get it right. We’re going to fix it. *Martin, Ware, Salako, Humphrey, and Zamort were on the team’s Practice Squad. 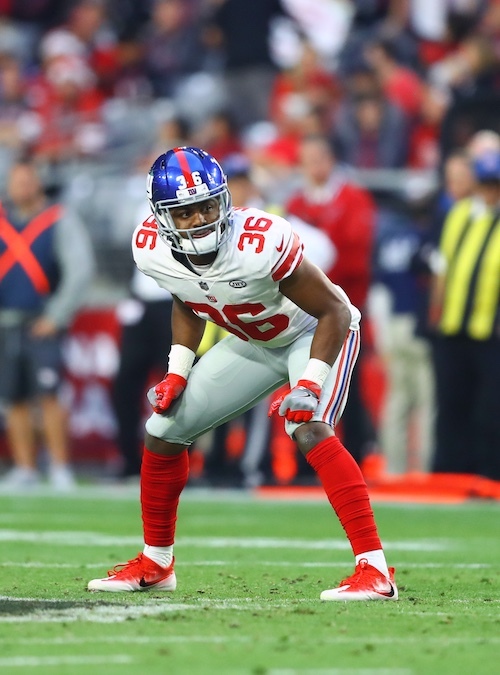 The Giants signed Martin to the Practice Squad in September 2018. The Giants originally signed the 5’11”, 207-pound Martin as an undrafted rookie free agent after he impressed at the May 2018 rookie mini-camp as a tryout player. Martin also flashed for the team during the preseason. The 30-year old, 5’11, 186-pound Golden was originally signed as an undrafted rookie free agent by the Chicago Bears after the 2012 NFL Draft. He has spent time with the Bears (2012 and 2013), Jacksonville Jaguars (2012), and Arizona Cardinals (2013-2017). Golden played in 44 regular-season games with the Cardinals with one start. He has 18 career receptions for 293 yards and one touchdown. Golden also has experience returning kickoffs and punts. The Giants signed Ware to the Practice Squad in October 2018. The 6’7”, 317-pound Ware was originally drafted in the 7th round of the 2017 NFL Draft by the Oakland Raiders. The Raiders waived him before the 2018 regular season started. He has played in one regular-season game with no starts. The Giants claimed Salako off of waivers from the Cleveland Browns in August 2018 and then signed him to the Practice Squad in September. The 6’5”, 316-pound Salako was originally signed as an undrafted rookie free agent by the Philadelphia Eagles after the 2017 NFL Draft. He spent time on the Practice Squads of both the Eagles and Browns in 2017. The Giants signed Humphrey to the Practice Squad in October 2018. The 6’3”, 238-pound Humphrey originally signed with the Baltimore Ravens after the 2018 NFL Draft. He spent most of September on the Ravens’ Practice Squad. The 27-year old, 6’1”, 237-pound Anderson was originally signed as an undrafted rookie free agent by the Chicago Bears after the 2015 NFL Draft. He has spent time with the Bears (2015-2017) and Arizona Cardinals (2018). Anderson played in 31 regular-season games with the Bears with three starts. He has 53 career tackles. The Giants signed Zamort to the Practice Squad in October 2018. The 5’10”, 174-pound Zamort originally signed with the Arizona Cardinals as an undrafted rookie free agent after the 2016 NFL Draft. He has not played in a regular-season game. The New York Giants held their second full-team summer training camp practice on Friday at Quest Diagnostics Training Center in East Rutherford, New Jersey. The complete training camp schedule is available at Giants.com. Not practicing on Friday were defensive tackle Damon Harrison (“being eased into camp”), defensive lineman R.J. McIntosh (unknown – Active/Non-Football Illness list), cornerback Sam Beal (shoulder), and tight end Garrett Dickerson (hamstring). The starting safeties today were Landon Collins and Curtis Riley. The second-team safeties were Andrew Adams and Michael Thomas. Darian Thompson worked with the third team. Cornerback Grant Haley intercepted an underthrown deep sideline pass from Eli Manning intended for wide receiver Sterling Shepard. Haley then almost intercepted a pass from quarterback Kyle Lauletta. Safety Curtis Riley nicely broke up a sideline pass intended for tight end Rhett Ellison. Tight end Evan Engram, wide receiver Travis Rudolph, and running back Wayne Gallman all dropped passes. Wide receiver Odell Beckham, Jr. made a great catch on what looked to be an overthrown deep ball from quarterback Eli Manning. Linebacker Ray-Ray Armstrong blew up a screen pass intended for running backs Jalen Simmons. Quarterback Davis Webb threw a nice seam pass to tight end Jerell Adams. Webb then threw another completion to wide receiver Amba Etta-Tawo, who made a full-extension catch in traffic. 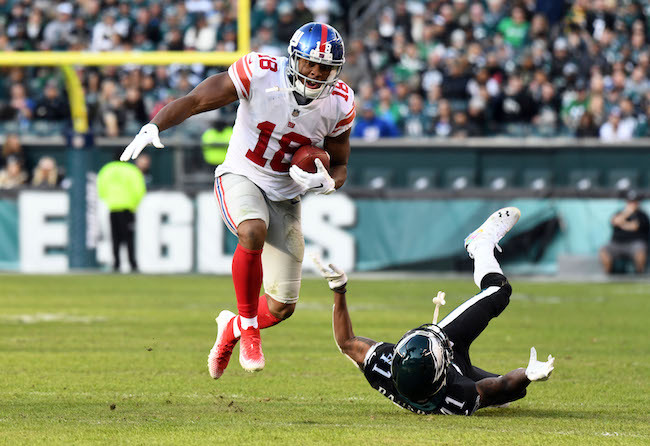 Quarterback Eli Manning and wide receiver Sterling Shepard connected on two good gains. Safety Landon Collins picked off an errant pass from quarterback Eli Manning intended for wide receiver Odell Beckham, Jr.
Quarterback Davis Webb threw a very nice touch pass to wide receiver Kalif Raymond. Cornerback Donte Deayon broke up a quarterback Davis Webb pass along the sideline. Linebacker Connor Barwin flashed on a few plays, penetrating into the backfield; linebacker Avery Moss also flashed off of the edge. Safety Orion Stewart picked off a pass from quarterback Alex Tanney. The transcript of Dave Gettleman’s press conference on Friday is available in The Corner Forum while the video is available at Giants.com. 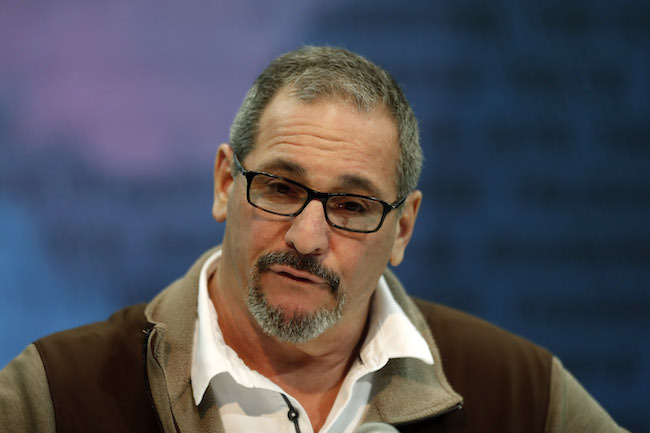 New York Giants General Manager Dave Gettleman has been diagnosed with lymphoma, a type of cancer that starts in lymphatic cells that are part of the body’s immune system. “Recently, I underwent an annual physical, during which it was discovered I have lymphoma,” said Gettleman in a prepared statement. “Over the past week, I have undergone more testing to determine the course of treatment, which is scheduled to start in the very near future. The doctor’s outlook for the treatment and the prognosis is positive, and so am I. “I will continue to work as much as the treatment process will allow, and as they know, when I am not in the office, I will be in constant communication with (Head Coach) Pat (Shurmur), (Assistant General Manager) Kevin (Abrams) and the rest of our staff. The New York Giants have signed unrestricted free agent punter Taylor Symmank. The 25-year old, 6’2”, 195-pound Symmank was not drafted in 2016. The Minnesota Vikings signed him in January 2017 and waived him in early September of that year. Symmank punted nine times during the 2017 preseason, averaging 42.9 yards per punt. The Giants held their eighth voluntary organized team activity (OTA) practices on Tuesday. No live contact is permitted during OTAs, but 7-on-7, 9-on-7, and 11-on-11 drills are allowed. The two remaining OTA practices will be held on Wednesday and Thursday. A mandatory mini-camp will be held on June 12-14. 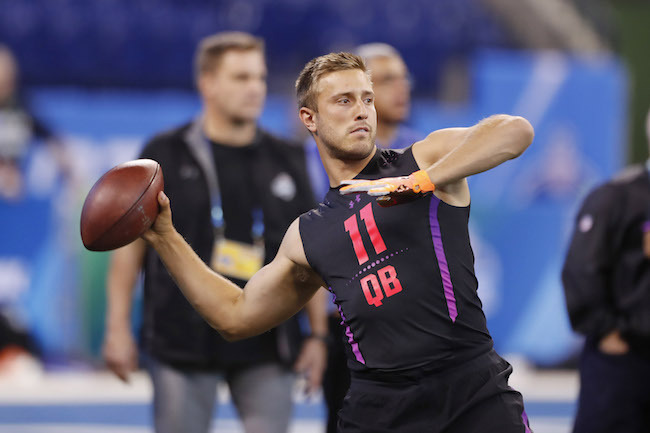 With their 4th and 5th round picks in the 2018 NFL Draft, the New York Giants selected 6’2”, 222-pound quarterback Kyle Lauletta from the University of Richmond and 6’4”, 286-pound defensive tackle R.J. McIntosh from the University of Miami. KYLE LAULETTA SCOUTING REPORT: Lauletta was a three-year starter who led his conference in passing each of those seasons. Lauletta lacks ideal height, but he’s a well-built quarterback. Lauletta knows how to run an offense, makes smart decisions, is poised, has a quick release, and is an accurate thrower. A good short- to intermediate-passer, Lauletta’s lack of arm strength limits his game outside the hashmarks and down the field. Most pundits see him more as a career back-up than potential NFL starter. MVP of the Senior Bowl. Fifth year senior that started for four years. Lauletta wasn’t really on the radar until Senior Bowl week. I thought he did a favor for someone by even getting on to one of the rosters. As the week progressed he was consistently proving to be a really effective short to intermediate passer. The release stood out to me. It was so quick and repeatable and the ball was almost always put on the money. I went back and was able to get 4 of his games in from 2017, 2 from 2016. There is a hole in his power game, as he just can’t put the ball on the rope and his throws outside the hash marks lack zip. But in a system that can hide those issues somewhat, Lauletta does a lot of other things at a high level. I think he is a career backup, but a dependable one that can stay under control and keep things sane. R.J. MCINTOSH SCOUTING REPORT: Junior entry. McIntosh is a tall, athletic defensive tackle who could project to defensive end in the Giants’ 3-4 defense. He has a very quick first step, is agile, and will chase in lateral pursuit. Active, hustling play-maker who is able to penetrate into the backfield. McIntosh can have issues at the point-of-attack against the double team. He flashes as a pass rusher. Junior entry that has been a steadily growing presence in the ACC for the past 2 seasons. Overlooked in the exciting, playmaking, talent-loaded defense at Miami. McIntosh is a versatile playmaker that has a natural sense in the trenches. He is very good at getting his hands up against the short passes, very active against the run, and will make his presence known at some point. He had one of the more impressive performances against Quenton Nelson in 2017. Gettleman: Kyle Lauletta of Richmond. He was just too good of a value to pass up there. He’s got all the stuff – he’s tough, he’s not shy in the pocket, he’s got pocket presence, patience and feel, which, again, those are instinctive things that you can’t teach. He throws a really nice ball, he’s accurate, he’s got a sense of anticipation and timing and the other part is he’s a runner. He’s got legitimate escape dimensions and we’re really pleased about that. He was just too good of a value there for us. We’re really thrilled to get him there. I really expected him to be long gone. Shurmur: With Kyle, I think Dave said it, we want to develop a good and a solid quarterback culture here. This is a guy that’s a winner. I think there are people that say he doesn’t have enough arm strength. I disagree. I think he’s got all the traits, all the things you’re looking for in a quarterback – he’s tall enough, he’s got good mobility and really arm strength is about fourth on the list. You have to be a good decision-maker, you have to have a sense of timing and you have to throw an accurate ball, which he does. He does all those three things well and he uses his feet to get the ball where he needs to get it and that’s really what I was impressed by – he’s got a good set of legs, he’s tall enough, he’s a winner, he’s got moxie, he’s very competitive and so we’re glad to add him to the group and he’s one of those guys that’s going to come in and compete and be as good as he can be. If at some point he is not the starter, then he is going to do what he can to help the starter be good and that’s what I’m talking about when I say we want a great quarterback room. I’m really thrilled that we could bring him in and try to develop him and see how good he can be. Gettleman: As far as RJ McIntosh is concerned, he’s an inside player, an inside defensive tackle. You can never have too much power in there. The kid has good power, he’s a good athlete and the other thing is – I talk about pass rush and everybody rolls their eyeballs at me upstairs. He’s got inside pass rush potential and there is stuff going around that he is 285, 290 – he really played at 300 pounds and had some kind of thyroid condition and got a little out of whack, so by the time they put him on the scale he was light. I’m not concerned about that at all. He’s young and he’s got upside, I know you guys hear it all the time, but this kid is athletic, he’s got power and he has the ability to develop into an inside pass rusher. Shurmur: Not much more to add. I think he can play a three-technique, he can play the critical five-technique for us. He’s developmental in some ways with his body, we feel like he can be a really, really big man and that’s what you’re looking for. He’s got a really good skillset and good traits in terms of movement and he was productive and played well on a really good team, not to mention he’s a high character guy as well. We finished the draft with six guys we all really liked as players, so we feel really good about him being our sixth. Q: You talked last week about the balance of long-term and short-term. Is Lauletta a good example of that? Gettleman: Where we had him on the board, we couldn’t pass up the value. Very honestly and very frankly. I always am. I had a GM send me a text – they wanted to pull the trigger in the second round, but they got into team needs or whatever. At the end of the day, like Pat said, you want a good quarterback culture in the room and I think it’s going to be really healthy. This kid is driven just like Davis is driven and just like Eli is driven and you can’t put a price tag on that. Were we thinking long-term? Yeah, you have to because if you’re not thinking long-term, you always give into that situation where a guy retires or you cut him and you have nobody in line to replace him. You’ve put yourself in a very uncomfortable situation. Q: Was it always your intention to have three quarterbacks and what does this say about Davis Webb? Shurmur: Yeah, I think once again to your point, I think it’s good to have three quarterbacks. I think this league and our game is about good quarterback play and I think it’s about development of the quarterbacks. So the longer they’re around you, the longer they can develop in your system. We wanted to go to camp with three and we’ll probably add another one – four quarterbacks — and go through camp that way and then just see where it goes. For a very long time, I was on teams where we would just keep three quarterbacks active. Another model is to have two and one on the practice squad, so we’ll see where it goes. Picking Kyle has less to do about Eli and Davis and more to do about Kyle. We liked the player and we wanted to add him to our team and then just let them compete. The one good thing about quarterbacks is I’ve watched it with my son, they’re always drafting, or in the case of college, they’re always recruiting the guy to replace you, so they’re used to competition. I don’t think you’re going to be a very good quarterback if you don’t look forward to it, so there is competition in the room – Kyle is going to be smart enough to learn everything he can from Eli and Davis and they’ll all try to be as good as they can be and then whoever becomes the starter, the other two guys can help him during the week, so that they can perform at a high level. So that’s a long answer to your question. Q: But neither Webb nor Lauletta of those guys have taken any regular season snaps. Does that worry you? Shurmur: No. We put the best guy in there and you can only go with the information that you have. We’ll try to get them as good as they can be within our practice format and then in the preseason and then just see where it takes us. There’s a reason why not all first round draft pick quarterbacks make it and all late round quarterbacks don’t make it. You just put them out there, let them play and see what happens. Q: How much did the uncertainty of Davis not playing at all last year play into taking Lauletta? Shurmur: Not at all. Like I said, it was all about Kyle and less about Davis and Eli. Q: Did his Senior Bowl do something to shoot him up the board for you? Q: Did you see him in a private workout? Shurmur: Yeah, we had a private with him. The one thing I would add to what Dave would say about his performance is when you see a Senior Bowl setting for a guy that played a lower level of competition, it’s the first time you can see ? competition and see how they perform and he did an excellent job. Again, being a coach, that’s our real first exposure to the players is at the Senior Bowl, so guys that perform well there, as Dave said, a good performance there then all of sudden we dig deeper. We found out there was a lot there that we liked. Gettleman: When I was in Denver, John Mobley was at Kutztown and he just dominated that level of competition. I saw him play a game and in the second quarter he knocked the kid out, he just whacked him and I said, ‘Okay, I can go home now.’ So he got invited to the Blue-Gray game and played well, handled himself well and then he goes to the Senior Bowl and he steps up again, and that’s what convinced me that he was a first round pick and he had a nice eight, nine-year career. Q: Did you guys talk to Davis Webb so that he doesn’t get a perception of it being a lack of confidence in him? Shurmur: No. There is no lack of confidence. He doesn’t need to hear that from me. Q: This morning Saquon Barkley was talking about being a leader as a young player. Have you ever seen that happen on teams that you have been a part of? Gettleman: It’s very possible. Again, it’s like when I talk to these young kids and they’re 20, they’re 21-years-old and I tell them that they’re walking into a locker room with 28 and 29-year-old men who have families and mouths to feed. He’s smart and he’ll figure it out. I’m sure he’ll understand when he needs to assert himself, so to speak, and he’s a very self aware guy. It’s doable. There is no reason he can’t be. Leaders are leaders. Shurmur: I would certainly agree with that – the whole leadership thing and new players, old players. Really good older players tend to watch rookies because there are certain things that they may know that they don’t know, so I think a guy that can come in and be genuine and be his best can – young players can be good leaders. In my opinion and I’ve said this before, you don’t have to be extraordinary in any way to lead. You just have to have the courage to do the right thing at the right time for the right reasons and not really worry about the consequences — there’s no reason to say that a young player can’t do it as well as an old player — then you start to lead. What we have to do and what Dave has done is we want to put a locker room of more of those guys together and then they lead one another – then the culture of your team starts and ends in that locker room. Q: What’s your overall feeling on the draft? Gettleman: Has any GM ever sat in this presser and said we just drafted crap? No. I’m thrilled. I felt like we did really well. Again, you’re talking about a first rounder in the second round, two-second rounders you draft in the third round, we had Kyle where we had him rated and we had RJ where we had him rated. I’m thrilled with this draft. We got big butts, we got power, we got speed. Sorry if that was inappropriate. And we got a quarterback that we really liked, so I’m not angry. Q: When you look at the roster, how much do you look at it and think that there are still spots to fill? Gettleman: Part of this, part of the exercise, is creating competition – bringing in players to create competition. Listen, the roster process isn’t over. It’s not over and you build your roster. Roster building is a 12-month period. So am I happy with where we are right now? Yes. Do we have some needs? Yes. Do I want us to be better? Yes. It takes time. Folks, you have to understand, Rome wasn’t built in a day. This is a brick-by-brick deal and at the end of the day we’re going to keep making moves, shake up the back end of the roster until we get it right. Q: Any chance of trading back into the last two rounds of the draft? 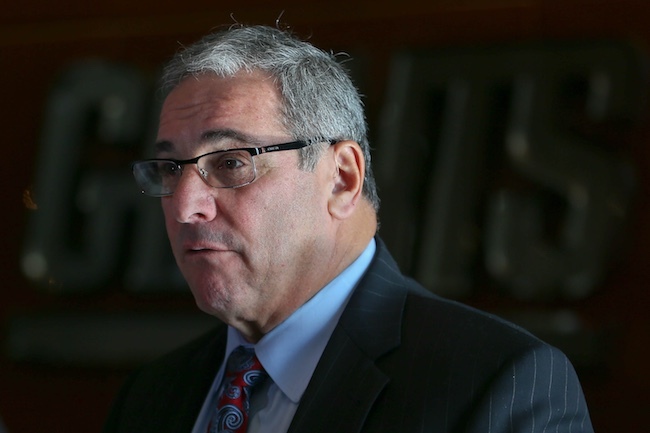 Gettleman: If I was going to do that, would I be sitting here talking to you? Q: Did anything surprise you about how the draft board fell for you guys? Gettleman: No, it didn’t. It’s really funny, it was a whole different process than we’ve done in the past and I think that there were some anxious moments when we were a little concerned, but we sat and we stayed patient and we stayed poised and where the board fell for us, we’re just thrilled how it worked out. The other part of it is that other teams are looking for different stuff. There were a couple of nerve-wracking moments, I won’t lie, but it fell to us. Q: How did you balance ranking best player against need? Gettleman: You put a value on the player. You can’t overvalue players. I don’t know if I ever told you this story, but when I pulled the franchise tag on Josh Norman, down in Carolina, anybody in any English-speaking nation knew we needed corners, okay? But when we got into the draft room, I told everybody, ‘We are not going to overvalue any corners and go for need.’ Let me tell you something: every time you go for need, you’re going to be angry with yourself. You’re going to be angry because you’re reaching. And if you’re in the second round, you’ve got two guys with second round values, and you’re reaching into the fourth round for need, I promise you it’s going to bite you. So, you don’t do it. Q: A few months ago, you may have not imagined sitting in that chair. How much did you enjoy this weekend? Gettleman: I had a ball. It was fun. It’s no different than you guys. Do you like your jobs? Please say yes. Someone that I knew owned a restaurant and said to me, ‘You’ve got a lot of pressure.’ I looked at him and I said, ‘And you do, too. You’ve got 8,000 people waiting in line, you’ve got to get the food out and it’s got to be quality food and you’ve got to do this, you’ve got to do that. I’d crack under that. You don’t.’ It’s what you do. I said it when I was talking to somebody before when somebody asked the same question, you guys have deadlines. You guys have deadlines and the editor’s screaming at you, ‘I want 15 articles on ‘bupkis.’ And you’re going to provide the 15 articles on ‘bupkis’. So, you’ve got to get it done. You can’t sit there and scratch your head and claw your eyes out. You’ve got to get down and sit at the computer and get it done. And you guys do it. I do it. Q: You have a lot of time now before the end of the draft. How do you guys plan on attacking the undrafted free agents? Gettleman: [Assistant General Manager] Kevin Abrams runs that. He’s already spoken to everybody. First of all, as Pat likes to say, you don’t win a toaster for being the first team to get to 90 players. Our goal is not to get to 90; our goal is to get to the right players. If we only get to 85, then we get to 85. If we get to 80, we get to 80. I’m not stressed out about it. We will target certain players that we want and we’re going to do our best to go get them. I told you the Andrew Norwell story, the Philly Brown story, we’ll do that. And that means – you guys understand you’ve got an undrafted rookie salary cap. You only get x amount of dollars that you can spend. So, we will use that as wisely as we can. So we will target guys, if that was your question. Q: Pat, can you clarify the toaster comment? Shurmur: I said that before about other things. Whatever it is, you win a toaster if you do something a lot, or too much. There’s really no context [laughs]. Q: Can you explain where all the defensive tackles will fit? Gettleman: Let me tell you something, okay? You can never have too many good players at a position. You don’t reach for need. There was one year in Carolina and we came out and we had 11 defensive linemen on the active [roster]. I don’t sit there and say, ‘I’ve got to have two of these, three of these, five of these.’ When we cut to 53, they will be the 53 best players on our football team regardless of position. Regardless. And the reason you want – first of all, you want competition. The fewer guys that you have – guys have got to understand that they’re not on scholarship anymore. You’ve got to earn your spot. And you don’t want anybody to feel like all they’ve got to do is show up, breathe, get their cleats on properly and not fall down getting out of the tunnel. The more competition, the better. You cannot have too many good players at a position. Whether it’s defensive tackle, quarterback, o-line, I don’t care. And the other thing you’ve got to understand is, the problem you get into, and I’ve seen it a number of times, you have a really good 11 or 12 guys and you don’t have quality depth behind them. What happens is the coaches, and rightly so, don’t want to put in the backups that aren’t very good. Okay? So, what happens is, guys end up playing 95-98 percent. In the fourth quarter, their tongues are hanging out. They are gassed. Let me tell you something right now, you see teams that consistently blow fourth quarter leads. Obviously that’s on the defense. I promise you they’ve got no depth. They’ve got no depth. You have to have quality depth. This is not about here or here, here, here. And I’ll tell you this: you’ve got a powerful defensive line and you can get pressure with four, you and I can play back there. Q: So, is the bottom line that you can have a really good draft after you finish 3-13? Gettleman: Hopefully, when we’re 13-3, we’re having just as good a draft. Q: Did you see the Giants on your radar and what was your emotion when you got the call? A: They were definitely on my radar. That was actually, the Giants were actually the very first team that I worked out for and Coach (Ryan) Roeder and I, I just feel like I hit it off with him and we connected really well and I was thrilled. Just the mix of emotions, getting that call, I’ve been dreaming about that for a long long time and just to have my whole family here, it was a dream come true. Q: What are your thoughts on just walking into this quarterback situation? A: Yeah, I mean obviously Eli has had a heck of a career and Davis, too, and honestly I just want to get in there and just get to know the guys and I believe it’s so important in the NFL to have a strong quarterback room and have a strong relationship with each other. There are so many times where you can help each other out and learn from each other, so first and foremost, I just want to get to know those guys and just get in front of the playbook and like I said, just get to know my teammates and just try to add value to that quarterback room. Q: A lot of times when a team picks a quarterback, a team looks at you as the quarterback of the future. With Davis already here, is that a little strange for you to have to come in and compete with another guy that’s in a similar situation to you? A: No, I don’t think so at all. They only have two guys, so they needed a third guy one way or another, and I don’t really look at it like that. Obviously in the NFL, you’re always going to bring guys in and you’re always trying to improve your team and that’s what training camp is for. I’m not really thinking about any of that right now. First and foremost, you’ve just got to get to know the guys and work hard and gain the respect of your teammates, and I’m looking forward to meeting Davis and Eli and I’ve heard a lot of great things. It’s interesting, going to the University of Richmond, there have been quite a few players that have gone to the Giants and they all say great things. Like I said, I’m just excited to get to know the guys and I just couldn’t be happier. I think it’s a great fit and I can’t wait to get started. Q: Do you come here feeling like you have something to prove? A: I don’t know. It’s kind of been the story for me my whole career, being doubted and kind of being the underdog. In high school I didn’t have all those big time offers that some of the other guys had and even coming out of college after my senior season, the scouts had me rated lower than I ended up getting picked, but I don’t worry about that. I’ve always been a firm believer in just honestly controlling what you can control and God has a plan and God saw fit that I would land with the New York Giants and I couldn’t be happier. I’m not coming here with something to prove. Obviously I want to compete and give the organization my everything and do my best to improve and be the best version of myself and in the end, that’s really all you can do and I’m just excited. This offseason has been long and especially these past two weeks before the draft just seems to drag on, but once you get that call, it’s just a big sigh of relief and I’m just excited to move in and just get to work and start building those relationships, because in football it’s such a great team sport and that’s the most important thing, is having a unified team and I just want to be a great teammate and help the team out however I can. Q: What do you think when you hear comparisons to San Francisco quarterback Jimmy Garoppolo and Philadelphia quarterback Carson Wentz? A: Well, that’s good company to be compared to. I think obviously the comparison because of the FCS connection. I don’t know, I think maybe my game resembles a little bit more of Garoppolo than Wentz, but two great young players, two smart guys, good people, too. That’s what I’ve heard around the league, is that they’re both great guys with great futures. So, if I’m mentioned in the same breath as those two, I’m thrilled. I’m just excited, like I said. I’m excited to be here and excited to get to work. Q: Has it sunk in yet, being a teammate to Eli Manning after growing up a fan of his brother, Peyton? A: You know, it has. I’ve heard a lot of great things about Eli and like I said, having the Richmond connection, a lot of players have over the years, I’ve kept in contact with those guys and they’ve told me about Eli and what a great guy he is and I can’t wait to meet him. Definitely Peyton Manning was one of my idols growing up and I admired his game, but I admired Eli’s game, too, and the fact that he won a Super Bowl and he has the pedigree that he has and the family that he has, I just can’t wait to learn from him and just kind of watch the way he goes about his business and kind of take away anything that I can to help my game out. But it’s awesome. I’ve watched so much NFL football and Eli has done it at a high level for a long time, so can’t wait to get in front of him and just hear what he has to say and just learn. A: I think, first and foremost, I’m a very accurate passer. I think I understand the game well. I’ve had four offensive coordinators in four years at Richmond. I’ve been exposed to so many different offenses and I think I have good feet, I think I throw the ball on time and just have a good understanding of where to go with the football and throwing it on time and putting it on the money. And I think there’s a lot of hype about sometimes how big you are, or how big your arm is and those sort of things, but Eli’s a perfect example. He’s not the biggest physical specimen in the NFL, but he’s incredibly intelligent, he understands the game and he’s accurate. And if I can model my game around a guy like that, like I said, I’d be absolutely thrilled. So, just excited for the opportunity. Q: Are you going to bring University of Miami’s ‘turnover chain’ with you to the Giants? A: I wish I could [laughs]. Q: Do you think the Giants are a good fit for you? A: Yeah, definitely. I think it’s a great fit. I think especially with the history of the D-line they have there and the players who are there. Definitely, a great fit. A: I think I’m a good player, I’m a quick player off the ball. I’m a hard worker and I think the New York Giants just got a great player. I’m ready to work. Q: You’ve played both 3-4 tackle and end at Miami, right? A: Yes, my first year I played at end and my sophomore and junior years, I played D-tackle. Q: Do you know defensive end Olivier Vernon at all? A: Not much. I’m sure I will get to know him a little bit more.